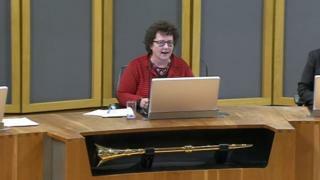 The way parties share influential jobs on Senedd bodies does not comply with the rules of the assembly, presiding officer Elin Jones has said. She has said that Plaid Cymru having more committee chairs than the Conservatives - despite having fewer AMs - was an anomaly. Senior AMs from Labour and Plaid think the situation should remain the same. Ms Jones, also a Plaid Cymru AM, has ordered a review to avoid the situation arising again. Since Mark Reckless joined the Tory group as an independent, Dafydd Elis-Thomas became an independent and Neil McEvoy was suspended, Plaid has been left with 10 AMs versus the Tories 12. That is a reversal from the assembly elections, when Plaid came out as the second largest group with 12 AMs and the Tories had 11. The assembly rule book - known as standard orders - stipulates that the balance of committee chairs between the parties should reflect the groups sizes. Ms Jones told a meeting of business committee - which decides which parties get which committee chair seats - earlier in October that the current situation does not conform to the assembly rule book. But despite Ms Jones saying at that meeting it must be resolved, senior AMs from Labour, Plaid, UKIP and the Tories on the committee have failed to come to an agreement. Committees direct important reports in the assembly, and have the power to take evidence during inquiries, scrutinise ministers and inspect legislation. Under assembly reforms implemented this year committee chairmen and women are elected by the AMs themselves - but what party they come from is still decided by the business committee group of senior AMs. After the last assembly election, Labour was given six chairs, Plaid Cymru three, the Tories two and UKIP one. The Tories want Plaid to lose one chair position, but Labour and Plaid argue there should be no change, arguing that the current allocation reflects the election result. The report says that the Labour and Plaid votes constitute a majority on the committee, and so it is their view that has "prevailed". The presiding officer, also known as the Llywydd, "is of the view that this impasse is unsatisfactory," the report said. "The Llywydd considers that the standing orders are clear as to the requirement the business committee has regard to the need to ensure that the allocation of chairs reflect the balance of groups, and so a situation where the Plaid Cymru group has more chairs than the Conservative group is clearly anomalous." Ms Jones "does not agree with the majority view on the committee", the assembly report said, "that the current allocation is acceptable in fulfilling that requirement". But Ms Jones acknowledged that a "tension exists within the standard orders between the independence of committee chairs on the one hand, and the need for their allocation between groups to reflect a potentially ever-changing political balance on the other". As a result of the row the Tories refused to support a vote in the assembly on Wednesday to fill vacancies on committees left by Neil McEvoy's suspension, and for Neil McEvoy to join petitions committee. Paul Davies, Tory business manager, said: "If this situation is allowed to continue, then it has become clear that the majority of this assembly no longer supports a balanced assembly that reflects the political balance of its members." Plaid Cymru's Steffan Lewis said: "The democratic mandate expressed by the Welsh people has got to be a significant factor in how we determine the composition of an assembly committee."